We see Atget’s antique Paris, its medieval streets and old houses and quirky residents, and also Abbott’s New York, with its remnants of history but also its newest soaring skyscrapers of the 1930s. 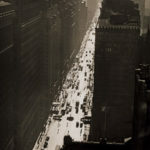 While the Surrealists acclaimed Atget’s eerie views of mannequins and carnivals, Abbott particularly admired his objective documentation of Paris, which shaped her own similarly extended project of systematically depicting New York. Just as Atget influenced her, she in turn had a great impact on the older man’s place in history: she acquired a significant portion of Atget’s estate and promoted his work in both France and the United States. Having succeeded in boosting his fame, she eventually sold her entire Atget collection to The Museum of Modern Art in New York, which ensured his lasting place in the history of photography.